Mega Sale! 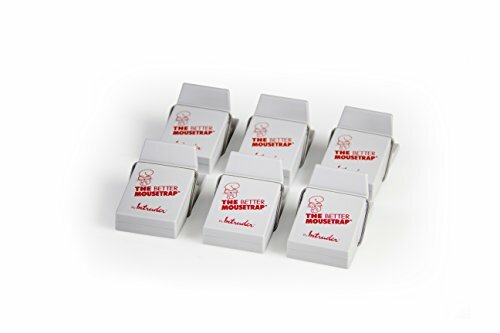 Save 25% on the Intruder 30442 The Better Mousetrap, 6-Pack by Intruder at Black Ant King Plus. MPN: 30442. Hurry! Limited time offer. Offer valid only while supplies last. The Better Moustrap is the Original easy set trap. Its simple design and few mechanical parts make it the most effective mouse trap on the market. The Better Moustrap is the Original easy set trap. Its simple design and few mechanical parts make it the most effective mouse trap on the market. Pinch to set, squeeze to eject, rinse and reuse– it’s that simple! Designed to suffocate, it captures and kills quickly – always without unsightly messes or unhealthy contact. When the safety of children and pets are a concern, The Better Mousetrap is the only safe and effective option. If you have any questions about this product by Intruder, contact us by completing and submitting the form below. If you are looking for a specif part number, please include it with your message.